When you peel an orange you're probably aware of the tangy bittersweet citrus smell that fills the air. This is the fruit's essential oil being released. Many other plants also contain valuable essential oils, each with their own special characteristics and healing properties. Virtually all essential oils have antibacterial properties and some have antifungal properties. Such is the complex nature of Aromatherapy essential oils that some oils, like Lavender, have a very varied and broad spectrum of effects and are extremely important and valuable in Aromatherapy Treatments. The oils work in two ways, directly by smell (smell is picked up by sensory cells in the nasal passage) and also by being absorbed through the skin into the blood stream in minute quantities. Sometimes both methods work in harmony to produce the desired result, i.e. in massage. The aroma given off by the oil has a direct effect on the part of the brain, which governs emotions. The brain is stimulated to respond to the mood provoked by the smell of the oil. When prepared as Aromatherapy oil and applied to the skin, essential oils are absorbed into the blood stream where it is believed they may help to stimulate the various systems of the body. 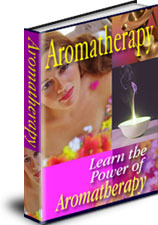 Pure essential oils are the basis for all Aromatherapy treatments. Whilst massage is the most common use, essential oils can also be used in baths, or as an inhalant. All essential oil fragrances fall into one of five fragrance families: GREEN, CITRUS, SPICY OR WOODY. One or more of these fragrance families will instinctively appeal to you Once you know which fragrance family you prefer you can restrict your initial choice of oils to those from that group. Citrus - essential oils, Grapefruit, Lemon, Orange. Woody - essential oils, Cedar, Frankincense, Sandalwood.